The Faraday instability occurs when vertically stacked fluid bilayers in bounded containers are subject to periodic accelerations in a direction that is normal to their common interface. The instability has its origins in the resonance between the imposed frequency and the system’s natural frequency. Models show that curves of critical amplitude versus imposed frequency vary non-montonically with the imposed frequency, for fixed cell widths. The competition arises between viscous damping at large frequency and small accelerations at small frequencies. The dip in a typical curve shifts with gravity level and this means that gravity can either stabilize or destabilize the system depending on the cell width. Our talk will focus on the theory and also display experiments in finite cells showing remarkable agreement with theoretical predictions. The presence of multiple energy states or co-dimension two points will be shown and the effect of gravity will be predicted. Experiments on Parabolic Flights will also be depicted. 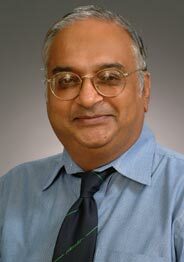 Ranga Narayanan is a Distinguished Professor and Distinguished Teacher-Scholar at the University of Florida, Gainesville, FL. His research is in the area of pattern formation. This field has applications ranging from earth science, to the making of materials in outer space and on earth, to biomedical science and even to cell biology. As an engineer, Professor Narayanan is concerned with science questions as to how length and time scales compete to form patterns and what fundamental connections can be made between the various physical situations that generate patterns. Applications of his research include ways to “tune” patterns to create better and useful products such as better drug delivery systems and better semiconductor and energy efficient devices. As a result of his work he now directs a major National Science Foundation research training “center” grant in the field of patterns in fluids and interfacial science that has affected over 35 doctoral students in the College of Engineering. In addition to research, this project seeks to internationalize graduate education. Ranga has over two hundred published papers and conference presentations and four authored and edited books. He serves as an executive editor of the Journal of Engineering Mathematics and is on the editorial board of several scholarly journals. In addition he has been invited several times as a visiting faculty to major universities in France, Japan, Germany, Belgium, Israel and India. Among his many awards are the A.v. Humboldt Senior Award (2016), J.W. Fulbright Distinguished Chair Fellowship (Israel 2012), European Commission Senior Scientist (2011-12), Distinguished Foreign Scientist Award from the Government of India (2011), a Chevron Chair at IIT Madras (2011), Japan Society for Science Foundation Fellowship (2009), J.W. Fulbright Senior Scholar Fellowship (Belgium, 2001), and Alexander von Humboldt Fellowship (1989). He is a fellow of the American Physical Society, the American Association for the Advancement of Science, the American Institute of Chemical Engineers and has been elected as Academician to the International Aeronautics Academy (2012). The University of Florida has honoured him with a Distinguished Professorship (2013), Edie Professorship (2012), Distinguished Teaching Scholar (2009), Florida Blue Key Distinguished Faculty Award (2010), an International (2012), International Educator of the Year Senior Faculty Award (2012), a UF Research Foundation Professorship (2002), a Chemical Eng. Department Charles Stokes Professorship (2003), two College of Eng. Teaching Awards (1995, 2000), a Professorial Excellence Award (1998) and a Teaching Incentive Program Award (1995).